Your partner is more than just a vendor. They are a business associate you can rely on to bounce ideas off of and make tough decisions. After all, two heads are better than one. Having a partner you can depend on really makes all the difference. A partner can really boost your productivity, but you have to find a partner with the right qualities first. Experience is everything. An experienced partner can bring crucial insight to the table. Their prior experience in the industry is exactly the outside perspective you need when brainstorming or fleshing out ideas. Staying goal-oriented is a must. Many businesses lack the drive to flourish. Setting clear and concise goals keeps you on track and encourages you to stay focused. Realistic business goals are also rewarding and incredibly motivating. Organization and communication are key. Organization and communication become even more vital in joint business ventures. With multiple minds working away at a project, it’s very easy to become overwhelmed by ideas. Keeping proper documentation, keeping lists, adhering to schedules, and regular communication will keep both you and your partner on target. Service with a smile. Research has proven that a positive attitude contributes to positive outcomes in the realm of business. Picking a partner who keeps their head above water, even as it’s rising, can keep you calm and centered. Pick a Proactive Partner. Time and time again, businesses find themselves victim to outdated technology. Their biggest downfall? Not being proactive enough. You and your partner should be bold, brave, and unafraid to get your hands dirty keeping up with the latest tech. However, it never hurt to exercise a little caution. Before committing to any major changes, do your research. Efficiency and effectiveness should always trump the curb appeal of new software and equipment. A partner you can rely on really makes a world of difference. Your partner is far more than just a product vendor, they’re another mind to bounce ideas off of and get insight from. Two heads are better than one, especially with a partner who is experienced, organized, positive, and proactive. For the latest IT news and trends, head on over to our blog. 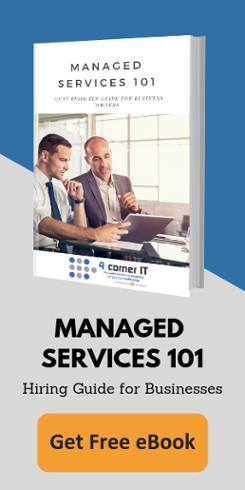 To learn more about 4 Corner IT and our IT support services in Florida, please contact us. We provide onsite consultations, 90-day trials, as well as free network audits. For over 17 years, 4 Corner IT has been proud to provide top-quality IT support and services throughout South Florida.